Customer communication management is an integral part of digital transformation. traditional systems provide capabilities that are siloed and does not have an integrated reusable solution. heavy reliance on it often negates the competitive advantage due to time taken to effect changes that are critical to businesses. Commuserve is a fully customizable digital servicing framework and a communication fabric with unique set of technologies brought together to serve the needs of all types of communications. 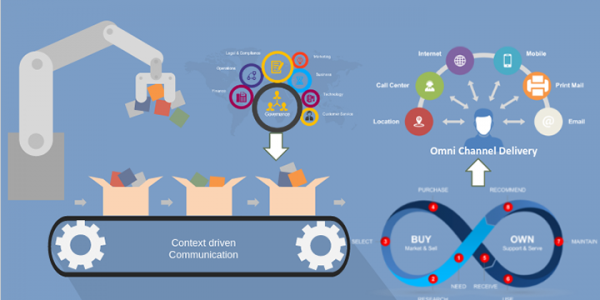 commuserve, has three integral modules for managing communications. they are intake, manage and serve. Is an AI driven engine that utilizes natural language processing and sematic processing along with machine learning to decode instructions from incoming communications. It also has capabilities to interact with IoT data to decipher actionable instructions. The Intake module also utilizes a digitization engine to convert paper communications to digital. Has multiple components for managing communications and is the nerve center of the CommuServe platform. It is built on robotic process automation/BPM along with command orchestration capabilities and helps to wire the business communication through its lifecycle. It also capabilities to manage outgoing communications using a reusable component-based template driven approach. Is the delivery engine for the CommuServe platform. It has omni channel capabilities and has ability produce and deliver communications through batch, on demand and interactive modes. It also has capability to interface with core business systems to deliver communications/messages. The fabric uses microservices patterns and uses a plug and play concept. The various services/ components are managed through a profile management mechanism and uses a fully automated configuration console for managing customer profiles and services enabled through the console.